In today’s world, technology is developing at an unprecedented rate. The latest gadget today is tomorrow’s antique. As a result of this rapid development of technology, we often take things for granted. One of these is the wheel. Take a look around, and you will see wheels everywhere, be it as tyres, or in everyday machinery. The wheel has even been imbued with symbolic meanings, most famously, perhaps, as a metaphor for the never ending cycle of life. One may be tempted to think that the wheel is just a humble or even primitive invention compared to some of the fancy gadgets that we have today. Nevertheless, the wheel (specifically as a means of transportation) was actually invented at a relatively late point of human history. 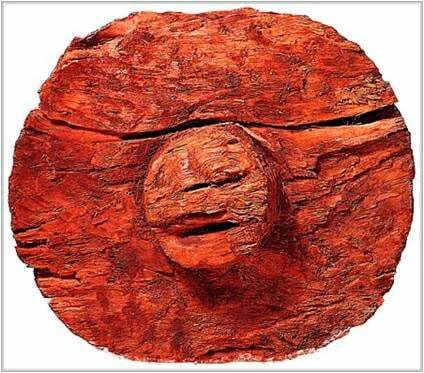 The oldest known wheel found in an archaeological excavation is from Mesopotamia, and dates to around 3500 BC. This period was known as the Bronze Age, which is a relatively late chapter in the story of the development of human civilisation. By this time, human beings were already planting crops, herding domesticated animals, and had some form of social hierarchy. A Mesopotamian wheel. Photo source . One of the reasons why the wheel was invented only at this point in history is due to the fact that metal tools were needed to chisel fine-fitted holes and axles. This leads to the next reason – the wheel was not just a cylinder rolling on its edge. It was a cylinder that was connected to a stable, stationary platform. This wheel-axle concept was a stroke of genius, but making it was a challenge. The ends of the axle, as well as the holes in the centre of the wheels had to be nearly perfectly smooth and round. Failing to achieve this would result in too much friction between these components, and the wheel would not turn. Although the axle had to fit snugly in the holes of the wheels, they had to have enough room to allow them to rotate freely. Given the complexity of the wheel-axle combination, it may be unsurprising that the wheel was not initially invented for transportation purposes. 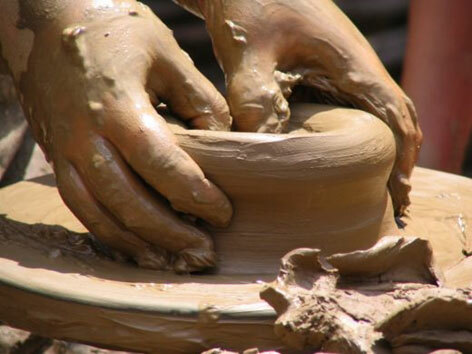 Instead, it has been claimed that wheels were first used by potters. Remember the 5,500-year-old wheel for Mesopotamia? It seems that it was a potters’ wheel (the use of wheels for pottery making may date even further back into the Neolithic). It seems that the use of wheels for transportation only happened 300 years later. The earliest wheels are believed to have been used for pottery making. Photo source . Although the world’s oldest wheel has been found in Mesopotamia, the earliest images of wheeled carts were found in Poland and elsewhere in the Eurasian steppes. Some have suggested that due to the immense challenge that the invention of the wheel posed to mankind, it probably happened only once, and spread from its place of origin to other parts of the world. However, others believe it developed independently in separate parts of the world at around the same time. For example, The Ljubljana Marshes Wheel is a wooden wheel that was found in the capital of Slovenia in 2002 and was dated to 3150 BC. At present, the birthplace of the wheel is said to be either in Mesopotamia or the Eurasian steppes. Although Mesopotamia has the oldest known wheel, linguistic evidence is used to support the claim that the wheel originated in the Eurasian steppes. Although the wheel has revolutionised the way early human beings travelled and transported goods from one place to another, the wheel was not a perfect invention. For instance, camels were a much more efficient form of transportation in the desert environment when compared to the wheel. It has also been claimed that between the 2 nd and 6 th centuries A.D., the camel supplanted the wheel as the primary mode of transport in the Middle East and North Africa. Nevertheless, the wheel was still used for domestic purposes, such as for irrigation, milling, and pottery making. This shows the various uses of the wheel, and its importance to mankind. I guess we ought to change our perspective about the wheel, and not view it as a basic invention by ‘primitive man’. Instead, we should view it as one of the great achievements of human society. 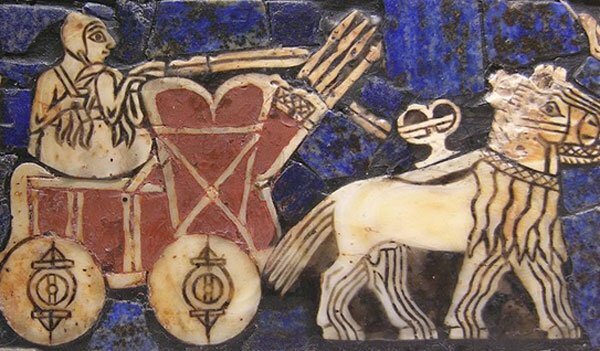 Featured image : A depiction of an onager-drawn cart on the Sumerian "battle standard of Ur" . Photo source: Wikipedia. is there any sign found in ancient maya of the wheel used ? idea must have traveled and remained popular following man all over as he moved, evolved grew and developed construction. especially of such great weights. it seem the egyptians and the chinese had it best constructed with their chariots, just an ancient cart would not have to have such a more precise balance since speed was not the game, just transport of goods, family, the wounded and the smaller constructions. It also seems strange why ancient man may have Not used the horse, camel or ox so as to help drag/haul heavy things for them/with them. where is first evidence of that ??? If you want to move something that is heavy and has a flat bottom, sprinkled a light amount of sand on your concrete garage floor in the path you wish to move the object. The grains of sand will act like thousands of small ball bearings - round wheels. As to regular wheels, Tubal-Cain forged all kinds of tools out of bronze and iron. He lived before the Flood - a date that is consistent with the author's 3500 B.C. (Genesis 4:22). Necessity is the mother of invention. When the wheel was needed, somebody invented it. Roundtine just doesn't roll off the toungue as easily.